Today, our pets live longer, healthier lives and enjoy an esteemed position in our households. They make us feel good; even after a tough day; we laugh and enjoy their antics. But pets also make us sad as we anticipate losing them. Meadow Hill’s Buddies give you keepsakes to both celebrate your pets and deal with grief as they move through life’s cycle. What matters most to Buddies with their pet products is that you are fully satisfied. This commitment includes workmanship, metals, engraving, and our customer service. 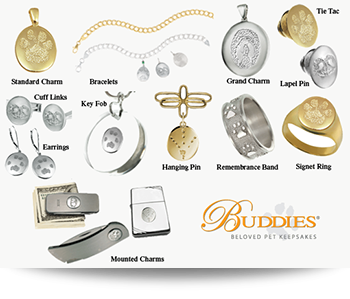 Buddies creates keepsakes that let you celebrate the fun and vitality of your pet, on the other hand, these products help you anticipate the loss of an aging our ailing pet.